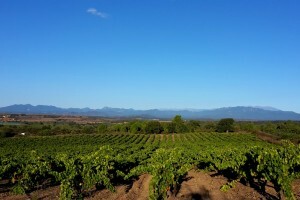 The hike through the vineyards of the Alt Empordà is a perfect holiday for those who like the combination of activity, relaxation and culture. Our longears will accompany you for five days, from accommodation to accommodation, over the hills of the magical wine region in Catalunya. When visiting the wine cellars, you can discover the secrets of the wines and harmoniously combine nature and culture. This tour is suitable for leisurely and sporty hikers, because the daily stages can be adjusted in length. And for those who do not drink wine, the hike itself is worthwhile because of the beautiful landscape and of course, the pleasant company! To have enough time to get to know the new companion, the first stage is not too far. 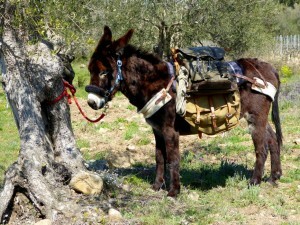 After an introduction to the donkey ABC you are ready for the hike! 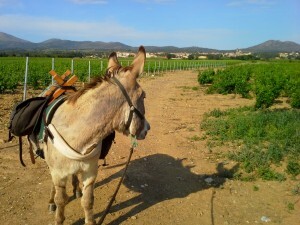 A path leads through the wine fields of Garriguella and later over a hill in the heart of the Empordà. Here we have a beautiful all-round view, from the Pyrenees to the Mediterranean. The end of this stage is a cozy accommodation in the medieval village of Peralada. Here you are free to visit the wine and glass museum in the Castle of Peralada, or else simply toast to the holiday with a glass of local wine or cava! On the second day, you walk between vineyards and olive groves towards the village of Mollet de Peralada. Very close to the village you can go to the winery La Vynietta, where you are able to taste some excellent and modern wines. A visit is worth it! The way onward to today’s destination is not so far anymore. In Sant Climent Sescebes you are warmly awaited by Roberto in the Casa Rural (Rural B&B)! If you would like to walk further, or focus on the diverse landscape, you can take an alternative route. This leads along the river Llobregat to the village of Vilarnadal and then goes over the Serra d’Altrera to Masarac and finally ends in Sant Climent Sescebes. Today’s route leads through a magical landscape. A picturesque path first leads to the hamlet of Vilartolì. Shortly after you arrive at the organic winery of La Gutina, whose excellent wines contain the spirit and the power of nature! After the wine tasting you continue leisurely. 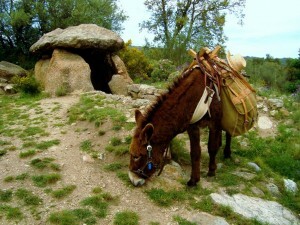 On the way to Espolla you will find dolmen and menhir (Celtic tombs and limestones), mysterious rock formations and fragrant smelling thyme and rosemary. 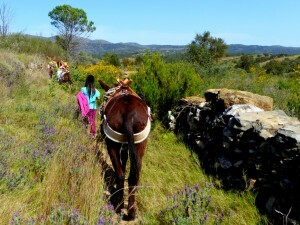 In short, a beautiful hike and a festival for the senses! Within the accommodation of Can Salas, which is in the former castle of Espolla, a variety of antique objects, which were used for agriculture years ago, can be viewed in a very personal and private museum. The house owner will be happy to tell you about their history! From Espolla to Rabós, you can choose to take it either comfortably or make it a longer journey. The trails lead through the secluded landscape at the foothills of the Abera mountain range and along the Orlina river, which is harmoniously embedded in the valley. Wine was cultivated here for many centuries. Hidden between cork oaks and bushes you can still find terraces and walls, remnants of past times. Now the area belongs to the nature reserve. The further along the path you go, the more diverse the landscape and the more magnificent the view will be. If you like a bit more of a challenge, you can even hike up to the monastery of Sant Quirze de Colera. Today already marks the last day of the hiking tour and you can again decide if you want to take the direct way to the wine cellar, or the panorama tour through the municipality of Vilamaniscle and the mountain range of the Serra de la Baga d’en Ferran. From here you can see the coast at the other mountain side of the Cap de Creus, where the Pyrenees dip into the Mediterranean Sea. A last stop at a hidden spring is a nice, final highlight before going back to Garriguella, where you have to say goodbye to the faithful companions. – The visit of the wine cellar is optional and must be organized independently. Check the website Prices. Here you will find information about prices and how the trails are organized.